The urbanization of the 20th century has led to more complicated and contested public spaces in which physical and social structures, new inventions and technology affect our movements, behavior and well-being. In this essay, writer and critic Victoria Bugge Øye takes as her starting point the current trend of creating “walkable” cities and emphasizing the centrality of pedestrians and pleasure in urban planning. She traces this lineage back to the intermingling art-and-architecture scene in Europe in the late 1960s; from the Paris Situationists’ creation of psychogeographic maps, to Viennese architecture groups’ invitations to pedestrians to play with gigantic inflatable soccer balls in the streets, and performances that coupled scientific research on pollution and its emotional effects on the city’s inhabitants. Øye delves into architectural practices that move beyond the idea of architecture as something "built", and rather view architecture as something to be moved around, sensed, played with, and experienced. 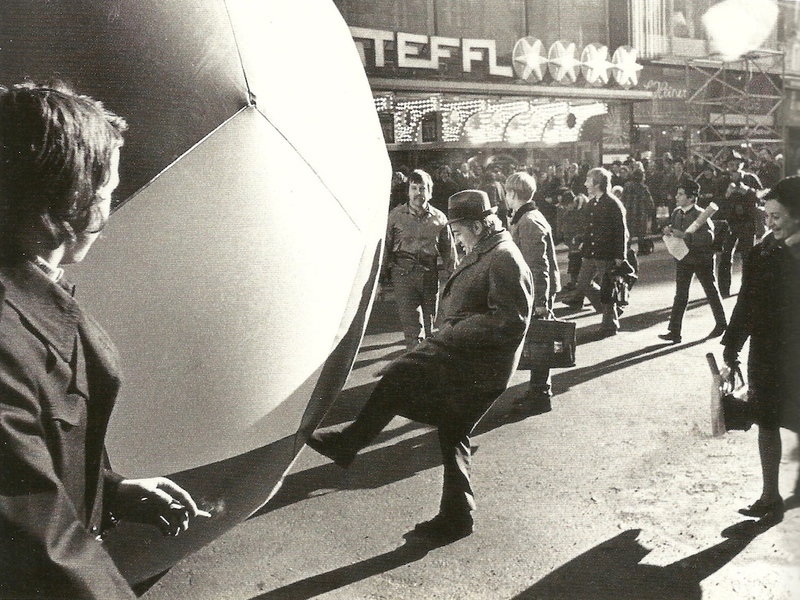 Coop Himmelblau, City Soccer (Stadtfußball), Vienna, 1971. Courtesy of COOP HIMMELB(L)AU. “Ute i Europa kan en se hvordan flere og flere byer tar konsekvenser av at de ikke er anlagt for biltraffikk. Bydeler blir avsperret for privatbiler, eller reservert for gående trafikk.” Øyvind Bjorvatn, “Gjør bilen oss til slaver i stedet for a tjene oss?,” Stavanger Aftenblad, June 1, 1968, 6. “Progress in the Implementation of Motor Vehicle Emission Standards Through June 1974,” Report to Congress (United States Environmental Protection Agency, 1974). 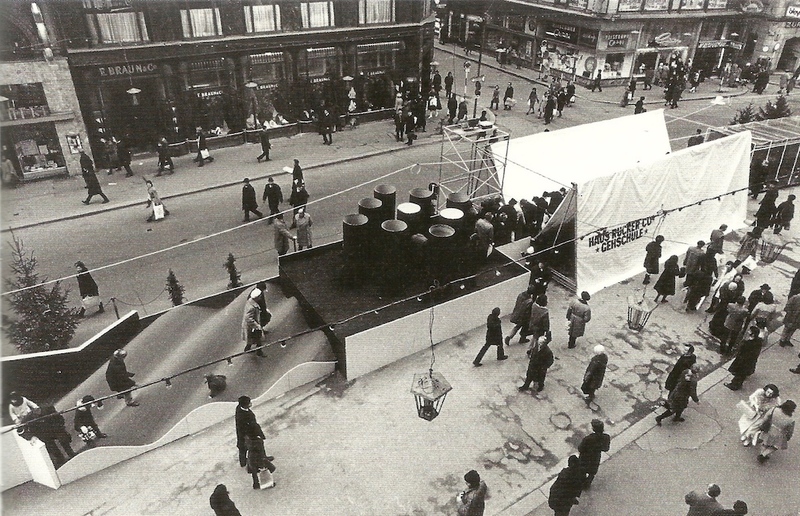 The pedestrian zone was a temporary project that became permanent in 1974. Today, the notion of “walkable” cities has become a habitual and important term for urban planners and architects, and prioritizing pedestrians is seen as progressive and sustainable policy for urban development. In the time since Bjorvatn´s op-ed, Stavanger has introduced several car-free streets downtown, and more recently Pedersgata was converted into a one-way street in an effort to curb traffic. Stavanger even funds public and urban art festivals to activate urban spaces and to make the pedestrian experience of the city more spontaneous and pleasurable. While all of these practices might seem very in tune with contemporary interests and concerns, most of them actually have their origin in the 1960s. By the late 1960s, the idea of introducing car-free zones in downtown areas, for example, was becoming increasingly popular for many reasons. Urban centers were hollowing out due to suburbanization and the construction of shopping malls, gas was getting more expensive (the 1973 oil crisis would force prices to sky rocket and leave traffic at a standstill), roads and neighborhoods were getting more congested as more and more people could afford cars, and pollution was becoming a serious health risk for people living in certain areas and threatened entire cities like Los Angeles. The idea that the city should be more than a functional center, but also provide stimulation and creative inspiration, was also an issue raised by many artists and architects of the time. For an entertaining podcast episode on Victor Gruen and the legacy of the American mall see Avery Trufelman, “The Gruen Effect,” 99 Percent Invisible, Episode 163, May 5, 2015, https://99percentinvisible.org/episode/the-gruen-effect/. Christiane Feuerstein and Angelika Fitz, Wann Begann Temporär? : Frühe Stadtinterventionen und Sanfte Stadterneuering in Wien (Wien; New York: Springer, 2009), 83. According to the situationists, automobiles did not only ruin the urban fabric because of the road expansion and suburbanization they caused, but because the isolation of enclosed vehicles also hindered communal and sensuous experiences of the urban environment. Thus, the centrality of the pedestrian was also understood to be the insistence on a more pleasurable and sensuous life. Radical ideas like the ones outlined by the Situationists were also in play at the official opening of Vienna´s fussgangerzone. At the time, Vienna was a hub for several experimental architecture groups, and two of them, Haus Rucker-Co and Coop Himmelblau, had managed to get on the bill for the official opening. It is worth noting here that neither Haus Rucker-Co nor Coop Himmelblau should be understood as architects in any conventional sense of the term. While they had all met in architecture school, they were more interested in creating installations, inflatables, and performances than buildings. In fact, the ephemeral quality of their works seems to undermine the very idea of architecture as something “built” all together. Architecture, instead, was something to be moved around, performed, played with, and experienced. Architecture was something to make you feel. “Kunst,” Der Spiegel, December 13, 1971. Feet, usually imprisoned in shoes traversing hard and flat asphalt, can be very sensitive and even erogenous organs, if only given some attention. Haus-Rucker Co´s Walking School was one way of unleashing some of the foot´s potential to give its owner pleasure and joy. Walfrid Reismann, “Zehntausende Stürmten Die Wiener Innenstadt,” Kurier, November 28, 1971, Sunday edition. Günther Feuerstein, “Hilfe, Die Proleten!,” Kurier, December 16, 1971. Haus-Rucker-Co, Walking School (Geschule), Vienna, 1971. Photo by Gert Winkler. As published in Christiane Feuerstein and Angelika Fitz, Wann begann temporär? (New York; Wien: Springer, 2009). 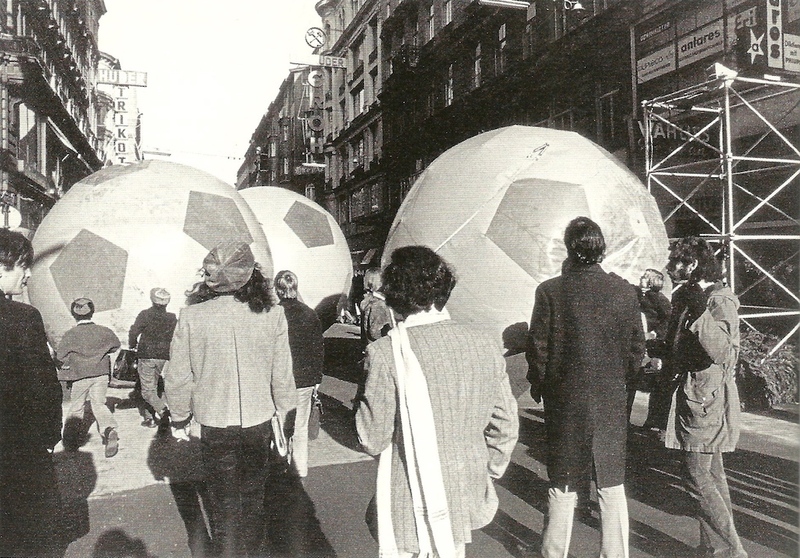 Coop Himmelblau, City Soccer (Stadtfußball), Vienna, 1971. Photo by Gert Winkler. As published in Christiane Feuerstein and Angelika Fitz, Wann begann temporär? (New York; Wien: Springer, 2009). “Does the Car turn us into slaves?” Asked the Norwegian politician Øyvind Bjorvatn, mirroring concerns that were also common among European avant-garde artists and architects. Stavanger Aftenblad, June 1, 1968. Günther Feuerstein, “Mondstrudel,” Kurier, July 22, 1969, Günther Feuerstein Archive. But while all of Haus-Rucker-Co and Coop Himmelblau´s installations were intensely preoccupied with multisensory and bodily experiences, they were not all exclusively centered around play. Several of their projects actually focused on play´s opposite in terms of energy level: downtime, relaxation and rejuvenation. Coop Himmelblau´s Insider project, for example, consisted of a transportable and inflatable bed-pod where the user could retreat and enjoy soothing music accompanied by light projections. 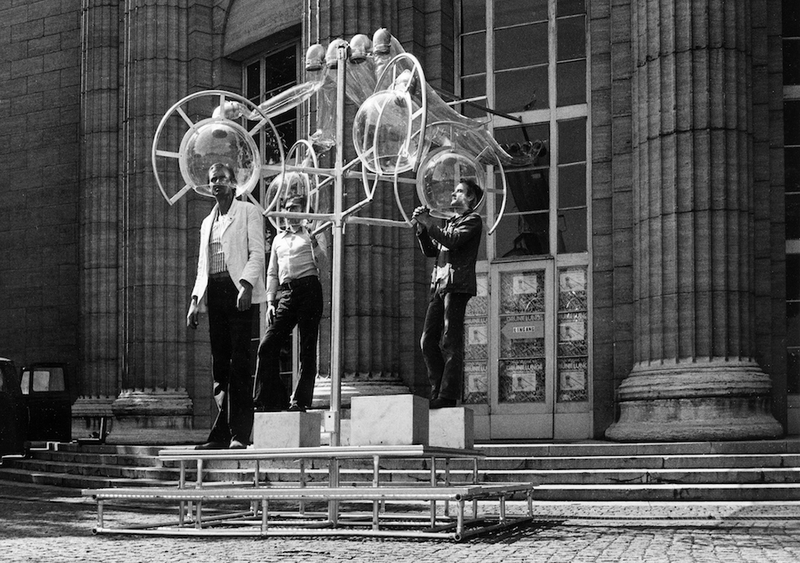 Haus-Rucker-Co´s installation Grüne Lunge (Green Lung) at the Kunsthalle Hamburg in 1973 consisted of an exterior platform with four transparent helmets where users could breathe air sourced from inside the Kunsthalle. 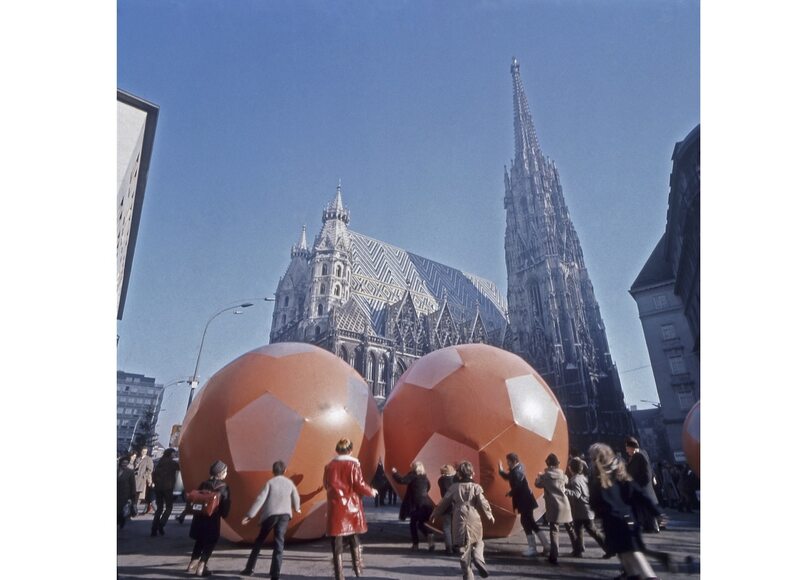 Although Haus-Rucker-Co and Coop Himmelblau´s various installations from the late 1960s and early 1970s differed in some of their strategies and means, what characterized them all was that they seemed intent on manipulating the user´s mood by encouraging the release of dopamine or oxytocin, the hormones most commonly associated with feelings of pleasure, bonding, relaxation, and connection. Daniel Lord Smail, On Deep History and The Brain (University of California Press, 2008), 157–89. Benjamin Campbell, “On Deep History and Psychotropy,” Culture, Medicine and Psychiatry 38, no. 2 (June 2014): 171. Wolf Prix, Interview, January 31, 2017, Vienna. Haus-Rucker-Co, Grüne Lunge (Green Lung), Kunsthalle Hamburg, 1973. Photo: Haus-Rucker-Co. Courtesy Archive Zamp Kelp. Psychotropic substances can, however, be found in air pollution. See Mark Wasuita, ”Ecstatic Air,” E-Flux Architecture, March 24, 2018, https://www.e-flux.com/architecture/superhumanity/179221/ecstatic-purification/. Aside from the potentially carcinogenic effect of long-term exposure, carbon monoxide immediately limits the level of oxygen the blood, resulting in fatigue and poor concentration. Manfred Haider, “Umwelteinflüsse Im Wohnbereich,” Wohnbauforschung in Österreich, no. Heft 1/2 (1972): 1–7. Prix, Holzer, and Swi, “Coop.Himmelblau Zur Ausstellung in Basel, Galerie Stampa Und ‘offener Saal’, Kunsthalle,” Kunst Nachrichten 7, no. 10 (June 1971). For the experiments, test subjects had been asked to sit inside the Airbox for around an hour. While seated inside of the inflatable, they would do specific tasks while being exposed to increasing levels of carbon monoxide. The test results clearly showed the subjects getting increasingly tired and unfocused as carbon monoxide levels rose. The experiments were later featured on the national broadcasting channel in Austria as part of a series called Surviving in the Polluted Environment that addressed the increasing car use in the country. Towards the end of the 1960s, Austrians were beginning to experience the ramifications of two decades of increased urbanization and industrialization, as well as the influence of an emerging international environmental movement, and Surviving in the Polluted Environment was symptomatic of all of this. The opening logo was an ominous flickering image of a leafless tree with the word “Überleben” (Surviving) spelled out beneath, followed by a series of jump cuts of automobile exhaust pipes, conveying at once the country’s increased automobile ownership and its consequences for Austrian everyday life. 'Abgase und Lärm,' Aktion Überleben in der Verschmutzte Umwelt (Vienna: ORF, May 5, 1970), ORF Archiv, Wien. Victoria Bugge Øye, “On Astroballoons and Personal Bubbles,” E-Flux Architecture, April 17, 2018, https://www.e-flux.com/architecture/positions/194841/on-astroballoons-and-personal-bubbles/. Feuerstein and Fitz, Wann Begann Temporär?, 84. Perhaps the business owners were correct in assuming that Coop Himmelblau and Haus-Rucker-Co´s installations would be more than the Viennese could handle, perhaps their own bourgeois anxieties got in the way, or perhaps what happened next was exactly in line with Coop Himmelblau and Haus-Rucker-Co´s desire for an architecture that could rouse emotions. Either way, as the evening progressed, things began to get out of hand. Vandals attacked the giant soccer balls with knives; the foot school caused so much commotion and became so vandalized that it eventually had to be removed. People are unpredictable beings, feelings even more so. Especially when architecture tries to get the best of you. Victoria Bugge Øye is a PhD candidate in the History and Theory of Architecture at Princeton University. Her field of research includes American and European architecture post-1945. She is a graduate from M.S. Critical, Curatorial & Conceptual Practices in Architecture at Columbia University, where she was awarded the prize for best thesis. Her writing has been featured in Domus, E-Flux and Los Angeles Review of Books, and she has participated in curatorial projects for the Buell Center, Storefront for Art and Architecture, The Lisbon Architecture Triennale, and the Canadian Center for Architecture.